Thirty-five years ago this month, there was a big change in Orlando television. 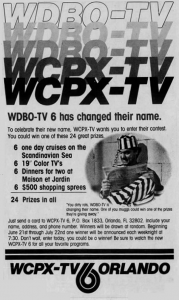 At 5:30 a.m. on June 6, 1982, WDBO-TV ceased to exist and WCPX-TV was born. It was still Channel 6, Orlando’s first TV station. But it’s historic call letters — which reportedly stand for “Way Down By Orlando” — were gone. You can blame a greedy, lazy station owner as well as the Federal Communications Commission, a movie company and even a soft-drink maker. In July 1981, Columbia Pictures reached a deal to acquire Outlet Company, which owned Orlando’s WDBO-TV, WDBO-AM and WDBO-FM as well as TV and radio stations in other markets. The deal was valued at more than $100 million. But there was a catch. Columbia, which produced and distributed movies and TV shows, also had broadcast properties. FCC rules limited how many broadcast stations a company could own. 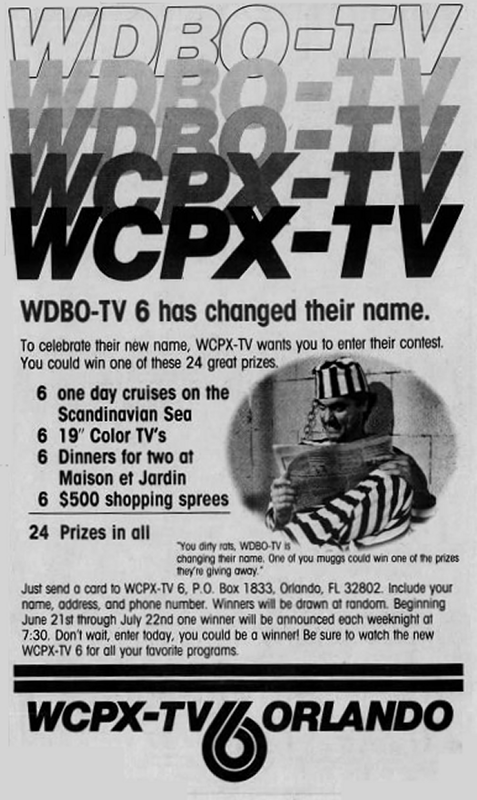 Advertisement announcing WDBO-TV’s change to WCPX-TV. The station gave away cruises, TVs and dinners to help get the word out abut the call-letter change. So, the plan was for Outlet to sell off WDBO-AM and WDBO-FM before the merger closed. Because of FCC rules, TV stations couldn’t have the same call letters of a radio station in their market unless they were co-owned, and whoever had the call letters first had first-dibs on them. Since WDBO-AM went on the air in 1924 — 30 years before WDBO-TV — the radio station and its FM sister would keep the iconic call letters. 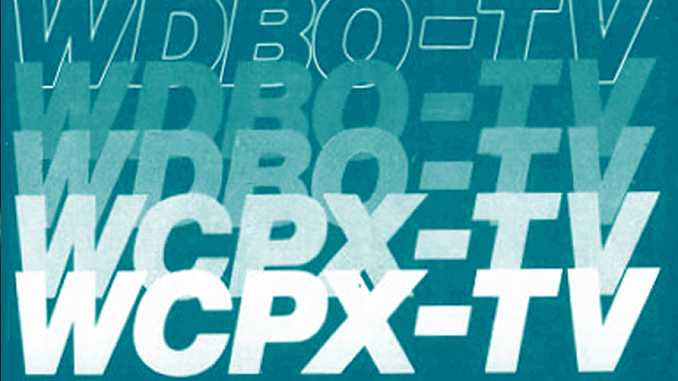 Outlet decided Channel 6 would change from WDBO-TV to WCPX-TV, with the “CPX” being short-hand for soon-to-be owner Columbia Pictures. But here’s where it gets a little crazy. Outlet and Columbia decided to call off their merger in January 1982, but Outlet decided to go ahead and sell off its Orlando radio stations anyway, dealing them to Katz Broadcasting in March 1982 for $9.5 million. Then a funny thing happened. Coca-Cola was looking at acquiring Columbia Pictures and decided to take another look at Outlet, wanting its television stations, including Channel 6 (which could have been renamed WCOK, right?). But the acquisition talks were not “The Real Thing” after all, and Outlet’s possible deal the soda giant ended in April 1982. But guess who did merge? The two companies with which Channel 6’s parent tried to make a deal. Coca-Cola bought Columbia Pictures for $750 million on June 22, 1982 — 16 days after Channel 6 switched from WDBO-TV to WCPX-TV. Outlet Company finally got what it wanted in the summer of 1986 and sold WCPX-TV for $200 million to First Media Co., which was owned by members of the Marriott hotel family. The WCPX-TV call letters would last for 16 years before being replaced on Jan. 30, 1998, when the Washington Post Co. acquired Channel 6 and renamed it WKMG in honor of longtime Post publisher Katharine M. Graham.